TL:DR Imagine that you can create ads that targets people dynamically based on your CRM. With ROI Hunter it is possible - you just create regular CRM exports and ROI Hunter will take care about the rest. Find inspirations how and why to use it in this article. So, how exactly does it work? Imagine that you have a group of people that would be interesting for you to serve ads to but that this group of people changes dynamically, our tool can help you. 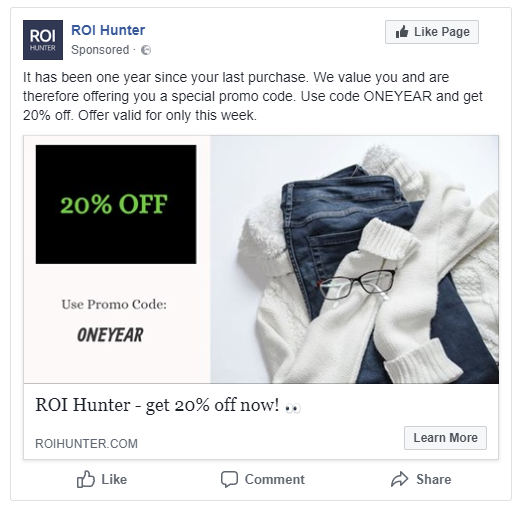 Look at this example, if you wanted to reach people who last purchased from you about a year ago, you can reach them with a special offer for a promo code of 20% off a new purchase, you would have to comb through your contact everyday and manually upload this file. In order to avoid this, our CRM Linked Audience tool will automatically update all of this based on a fixed point in time. 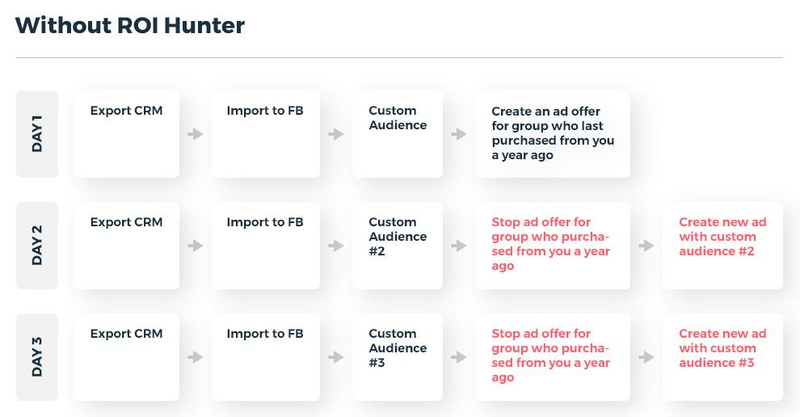 The process of creating such ad in ads manager would take about four steps and then you would have to do this everyday you needed to make the update. Another example would be if you want to contact people before their membership expires, or on seasonal habits of a specific group, or even to remind them of their loyalty card points. The possibilities are endless. However, what all of these examples require is someone having to complete manual task that, if we are being honest is monkey work. This is where ROI Hunter comes in. As you can see from the image above. you simply add the custom audience from your CRM and can easily exclude people that might not be as relevant. For example, those who recently purchased in the last 30 days. It really is that simple and is also ready for you to give it a try. If you are a ROI Hunter client, please contact your Client Success Manager for details on how to start. If you are not yet a client, then sign up for a consultation and demo. 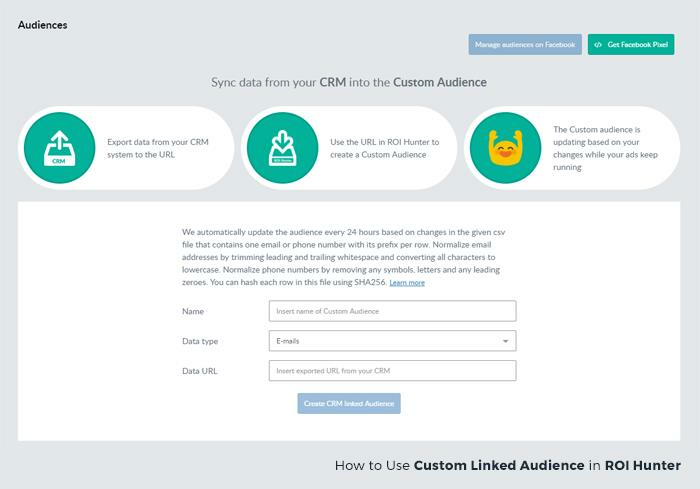 With our CRM Linked Audience, you can eliminate this manual task from your daily routine and set up a CRM export once and for all. However, what all of these examples require is someone having to complete manual task that, if we are being honest is monkey work. 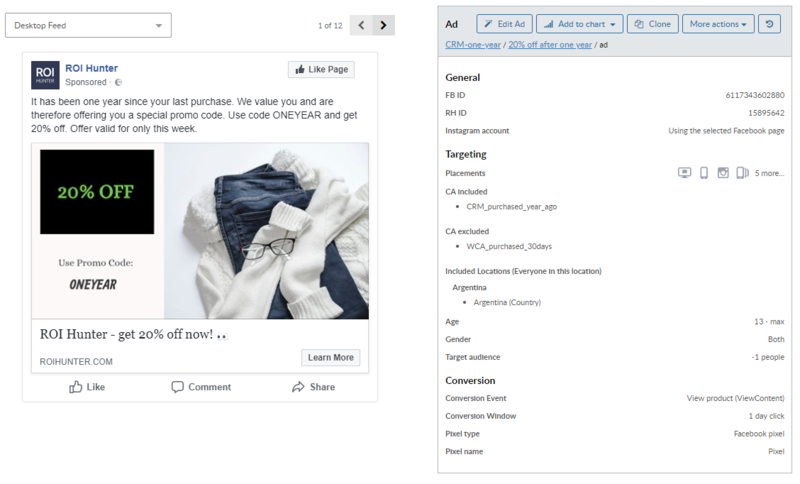 4 minute read Introducing Ultra Personalized Ads based on your CRM Marketing 5 minute read Turn your product feed into a Hero Feed! Technology 5 minute read Easily scale video ads production for e-commerce!